American astronomer and exobiologist, Frank Drake, proposed a simple (if, rather lengthy) algebraic equation, back in the early 1960’s - for determining the potential number of communicating civilizations/societies/populations, in our Milky Way galaxy as represented by the variable, N. These would be civilizations that are both, capable of, and are communicating, at some wavelength via the Electromagnetic Spectrum (EMS). These parameters might be applied to any spiral, or barred-spiral galaxy in the universe, comparable in size and age to the Milky Way. N = R* x Fp x Ne x Fl x Fi x Fc x L Graphic by Dale Alan Bryant. Radio Astronomy is an area of research which uses, giant, dish radio-telescopes for monitoring the sky for potential EMS signals from extraterrestrial civilizations/societies/populations, emanating from planets in orbit around stars, other than the Sun. The SETI (Search for Extraterrestrial Intelligence) Institute is the largest organization devoted exclusively to this area of research. The EMS, is the natural source of radio, television, visible-light, infrared, ultraviolet, x-ray, gamma ray, cosmic, and other radiations, which continuously surround us, and in fact, pervade the entire Cosmos. It is presumed that any intelligent beings that have reached a certain technological level of existence, will have discovered the potential for the EMS to be used in long-distance communication, particularly, interplanetary and interstellar communications. Where: N = the Number of galactic civilizations releasing detectable Electromagnetic Spectrum (EMS) signals into space. R* = the average annual Rate of solar-type star formation in the Milky Way galaxy. fp = the fraction of those stars, that form planets. ne = the average number of those planets, that lie in the star's ecological, or, habitable zone. fl = the fraction of those planets, that actually go on to develop life, at some point. fi = the fraction of those, life-bearing planets, that go on to develop intelligent life. fc = the fraction of those planets, that harbor intelligent civilizations/societies/populations, that are capable of developing a technology which releases detectable signs of its existence, through EMS emissions into space. L = the length of time, for which, a given civilization/society/population releases detectable EMS signals into space (the species, Longevity). In 1961, when the Drake Equation was introduced, it was thought that very few stars harbored planetary systems, and the conservative value of N, generally, was placed at around 36 million. But as of January 2017, it is known that - almost all stars - have at least one, orbiting exoplanet. (Planets orbiting stars other than the Sun are called, 'exoplanets') As many as 8 exoplanets have been detected orbiting one star - and, one planet - orbiting as many as four stars! More than 4,500 confirmed exoplanets are known, to date. Most of these planets lie within one tiny sector of the sky; the only sector analyzed by the Kepler Orbiting Space Telescope, during the first phase of its mission: an area about the size of a postage stamp held at arm’s length! It lies just east of the constellation Cygnus, the swan (also known as the Northern Cross). The number of new exoplanets being discovered through data which is still being reviewed from Kepler - is rising dramatically - and, so is our expectation for life elsewhere in our universe. Moreover - if algebraic equations are just not your cup of tea - I think you will find that this one, just might be! - the only variables in the equation that are currently known, are, R*, and fp, so, you can modify the values of the other variables and play around with the equation, conservatively or radically, as I have, to your heart's content! I've obtained values for N, from, in the millions - all the way down to...3. 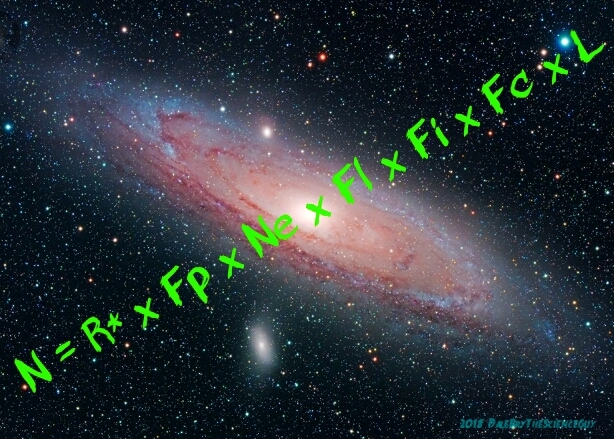 Here is a guide for plugging in quantities into the variables in the Drake Equation. I say, "guide", but only roughly: some of the variables are confirmed; some of them are assumed - and, still others are entirely unknown, so, as we progress down the line we become more and more unsure of their exact values. But this is where you come in! - YOU get to decide: the number of planets, where life, or even intelligence, has evolved, or, how many planets might lie in a sun's Habitable Zone - and so on. I've given you some figures - that I input - the last time I played with the equation, but the numbers can vary wildly, depending on your level of conservativeness, radicalism, or liberality, at any given time (please remember, we are using multiplication throughout).